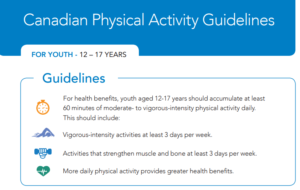 According to the Canadian Physical Activity Guidelines for children aged 5 to 11 and youth aged 12 to 17, children and youth should accumulate at least 60 minutes of moderate to vigorous intensity physical activity every day. As part of their daily 60 minutes of physical activity, it is recommended that vigorous-intensity activities that cause children and youth to sweat and be ‘out of breath’ such as running or swimming, be done at least 3 days per week. 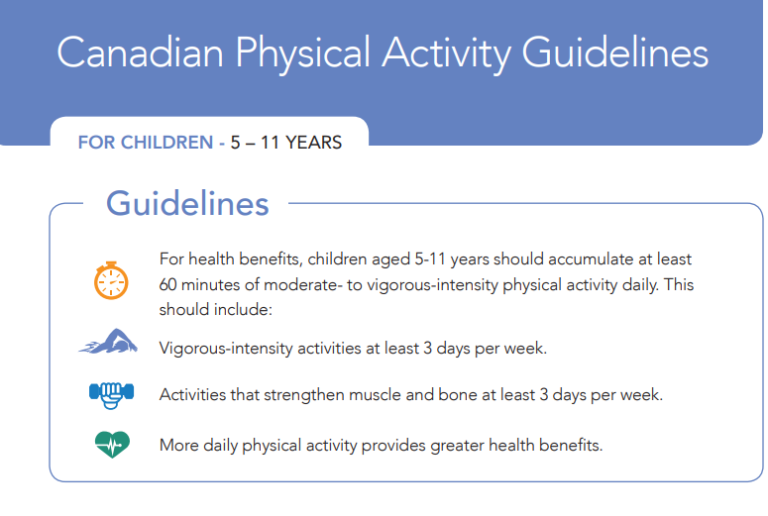 Activities that strengthen bones and muscles such as tree climbing, jump rope or tennis should also be done by children and youth at least 3 days per week as part of the 60 minutes of daily physical activity needed for health benefits.